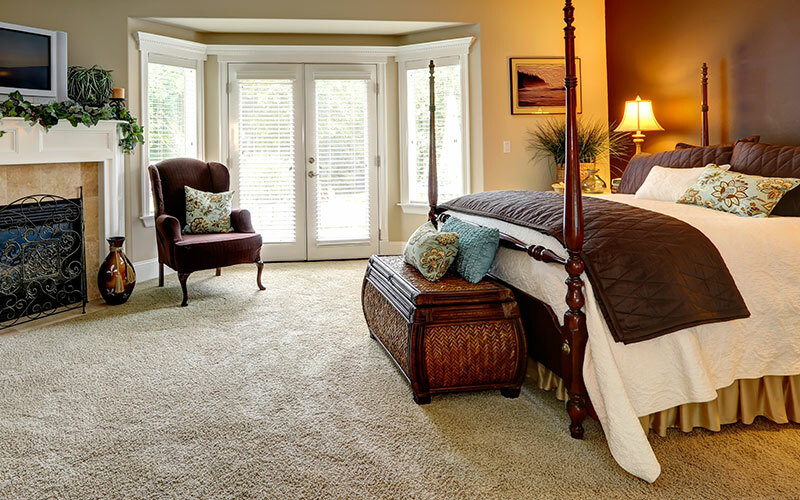 Choosing carpet for the bedroom is not like choosing carpet for other rooms in the house. Except for kids' rooms, bedrooms usually don't have the same foot traffic as other rooms in the house. Yet, having a soft carpet in bedrooms is desirable in most cases, as is selecting the right color and level of stain protection. There are two major categories of types of carpet: cut pile and loop pile. Loop pile has a tight profile but limited cushioning. It is very durable and meant for high traffic areas. Cut pile carpets cut the loops to provide a fuller look and softer feel. That luxurious carpet feel comes from a cut pile carpet. Higher quality carpets have a higher pile density. This leads to a stronger carpet with more durability. Bedrooms don’t usually have the same foot traffic as a living room or hallway. That’s why they are the perfect space to install a softer, more luxurious carpet. The carpet pad is a layer of soft foam that sits between your carpet and your floor. When the carpet material and carpet padding work together, you have a carpet that people want to walk on barefoot. If you are the type of person to snack or have a glass of wine in the bedroom, then give some thought to stain protection. There are many levels of stain resistance. The better the carpet, the better the stain protection. Stain protection is helpful because when an accident occurs, it buys you time. But, stain resistant or not, it is important to address stain removal with speed and act with the correct method. Remember: blot don't rub. Rubbing damages the carpet fibers. In 2013, Travelodge surveyed several thousand Britons to study their bedrooms. The study revealed how much color affects what happens in the bedroom. The study revealed that soft blues, yellows, and greens all help with a better night's sleep. The worst colors for sleep were clear: brown, grey, and purple. Still have questions about picking the right carpet? Download the Kermans Carpet Buyer’s Guide to learn more. Then, when you are ready, visit our Indianapolis showroom and talk to one of our talented design consultants.